We are a grassroots organization, without any funding, other than what you are willing to gift us. We recently received our 501(c)(3) Charity Organization status. We also accept donations through PayPal using a debit, or credit card. 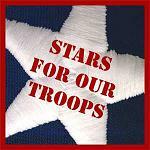 Susanw/Stars for our Troops Inc.
Thanking those that served and are serving.